I think there's some sort of odd conspiracy to keep these pics off the net for some reason. I have taken pics of these two soakers 2 or 3 times so far and only have these pics to show for it. Currently I'm doing a deep search of my computer with Picasa in hopes that I'll find them buried somewhere very remote, but till then, here are pics of my very first soaker (the striped one, a Curly Purly knit-in-the-round soaker) and a soaker that I rescued. 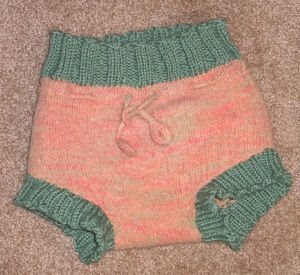 The peach one was a Freecycle hand-me-down that accidentally got into the diaper wash and felted & shrunk up pretty good. 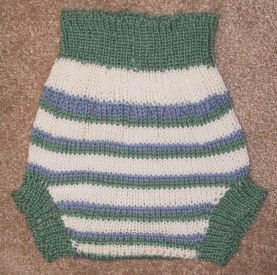 It used to fit my 3 yo DD, but now it sorta almost fit E with a little prefold peeking out here and there so I added the green ribbing to provide better coverage. Now it works quite nicely. The peachy orange yarn has wisps of green in it so hence the green color I chose. The Curly Purly soaker is very nice, but also too big for E so I'll probably make a smaller one soon. So far I've really liked that pattern as well as the Ottobre pattern. I'd like to do both of them again, but would also like to try some of the other patterns out there as well. Currently I'm working on a wrap soaker. After that I might try the Tickle Turdle Wrap. Since it's crochet it should work up quickly.